Well, a science student, anyway. While I was at my parents’ house I went through some old boxes of books and I came across the field notebooks I used for various projects back in college, filled with pages and pages of notes and data. It brought back a lot of memories of all the different things I worked on – interactions between hummingbirds at a feeder in Costa Rica, counts of bird diversity at different sites in the area around campus, plant transects through bogs, my big senior thesis on how garlic mustard affected spring wildflower abundance. (None of this was ever published or anything, just various student projects.) 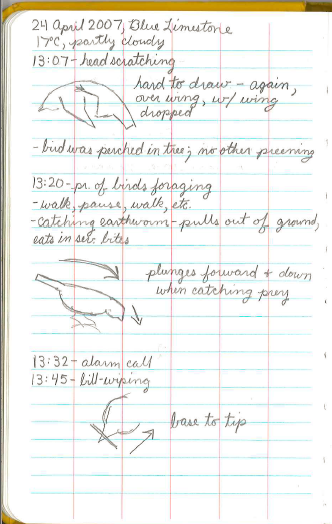 Here’s a page of notes on robin behavior for my ornithology class. This is my wimp-out post because it was really cold yesterday afternoon (I’m back in Wisconsin) and I only took a short walk and didn’t take any photos. One I day, I hope, I will look back to my notebook, and say ” I was such a noob with tardigrades back them”. See being in Arizona made you a wimp. Well, me too. I am in east Texas and right now it is 43 degrees. We had some sleet and light snow this morning but all is gone now. All of this is after Saturday when it was 70 degrees so I can’t put on enough clothes to keep warm. Nuthatches, goldfinches, chickadees, kinglets, cardinals, wrens and blue jays active at the feeders.